Infiniti will be blowing into the LA Auto Show later this year with a bevy of new versions of their 2009 Infiniti G37, including a new hard top convertible, G37 Sedan and AWD coupe. The G37x Coupe will be an AWD sports coupe alternative for those who can't quite afford a Godzilla. The G37 and G37s sedans will finally bring over the larger, 3.7-liter VQ V6 already found in the coupe. 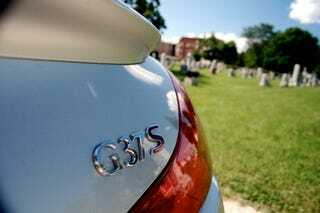 Finally, the G37s convertible will provide a hardtop alternative to the Lexus SC and 3-series convertible. Full press release below the jump. Nissan Releases New G-Series line When you have a vehicle line – say the Infiniti G – that has chalked up award after award, topped comparison test after comparison test, and endeared itself to a growing legion of passionate owners, what do you do for an encore? If you happen to be a world-class performance luxury brand – say like Infiniti – the answer is simple: Everything. The popular Infiniti G roars into the 2009 model year with an extensive array of changes, including: * The addition of an all-new Infiniti G37 Convertible model, slated to launch in the first quarter of 2009 * A new 328-horsepower 3.7-liter V6 engine for the Infiniti G Sedan – now designated the G37 Sedan * A new all-wheel drive model for the Infiniti G Coupe, the G37x * A new 7-speed automatic transmission for all Infiniti G models (6-speed manuals transmissions also available) "A little success makes you want to try harder. A lot of success makes you want to blow the doors off the competition again – which we're poised to do with the new, intensified Infiniti G lineup for 2009," said Ben Poore, Infiniti's vice president of marketing. "Year after year we strive to offer our customers one of the freshest product lineups in the industry – which we've done again in 2009 with the new second-generation Infiniti FX, upcoming G Convertible and the enhanced G37 Coupe and G37 Sedan." 2009 Infiniti G37 Convertible The all-new G37 Convertible, the first-ever open-air G, is set for a mid-2009 model year introduction. Based on the current G37 Coupe, the G Convertible promises stunningly seductive styling and G-worthy dynamic performance. The new G37 Convertible will feature a three-piece automatic retracting hardtop, to keep a coupe-like roofline, and available unique interior treatment. Audio and HVAC systems have been enhanced to provide an inviting experience with the top up or down. The all-new Infiniti G37 Convertible is set to make its world debut at the 2008 Los Angeles Auto Show in November. 2009 Infiniti G37 Sport Sedan The Infiniti G premium high-performance sport sedan receives a significant upgrade under the skin in 2009 with the addition of a new VQ37VHR "VVEL" 3.7-liter V6 rated at 328 horsepower. It is mated to a new 7-speed automatic transmission or close-ratio 6-speed manual transmission. Now designated as the Infiniti G37 Sedan, other major changes include new available sport brakes with 4-piston front/2-piston rear calipers and large 14-inch front and 13.8-inch rear rotors, a new sport 18-inch wheel design and standard Scratch Shield paint (self-healing clearcoat finish). The 2009 G37 Sedan is available in four models – G37, G37 Journey, G37S Sport 6MT and G37x AWD. It goes on sale in September 2008. 2009 Infiniti G37 Sport Coupe For 2009, the G37 Coupe's performance envelope expands with the addition of a new G37x AWD model with advanced ATESSA E-TSÔ all-wheel drive system. Also new for 2009 is a 7-speed automatic transmission with Drive Sport (DS) Mode and Downshift Rev Matching (the G37 Coupe is also available with a 6-speed manual transmission). All 2009 G37 Coupes receive standard Scratch Shield paint (self-healing clearcoat finish). The 2009 G37 Coupe is available in four models – G37, G37 Journey, G37S Sport 6MT and G37x AWD – each with standard 330-horsepower 3.7-liter VQ-series V6 with VVEL technology. It goes on sale in September 2008.